Maurer Grand Concert Model Flat Top Acoustic Guitar, made by Larson Brothers, c. 1920, made in Chicago, natural lacquer finish, rosewood back and sides, spruce top; mahogany neck with ebony fingerboard, black hard shell case. Any discussion of the finest flat-top guitars ever made will soon enough come around to the work of Carl and August Larson in Chicago between 1900 and 1940. Here is a well-played but still excellent example of their earlier style work, in this case labeled with their own pre-1930 "house brand" Maurer. 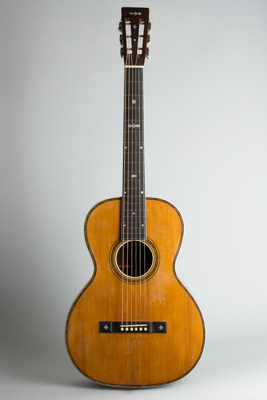 Larson instruments have become recognized as both uniquely desirable and historically important in recent years, and the laminated X-braced flat-top guitars like this one are among the most sought-after pieces. This guitar features medium level of appointments offered by the Larsons. The back and sides are of high-grade Brazilian rosewood with a dramatic figured grain to the back. The top is very tight-grained spruce. The top and back are single-bound with celluloid and bordered with inlaid wood marquetry trim around the top and a chain backstrip. The bridge features inlaid pearl clovers on the ends. The sound hole edge is also celluloid-bound with an inlaid marquetry rosette. The original finish is a thin varnish typical of the brothers' earlier instruments. The neck is one-piece mahogany with a surprisingly modern-feeling round "C" profile. The bound ebony fingerboard is inlaid with dainty engraved shaped pearl designs. The headstock is overlaid with Brazilian rosewood which is inlaid with a couple of delicate pearl doodads. The tuners are the same Waverly strips used by Gibson and Martin at the time, mounted in the older "backwards" orientation. The Larson Brothers distinctive construction and design elements are evident in this guitar. Unlike contemporary C. F. Martin instruments, this Grand Concert (14"+) sized guitar was intended from the beginning to carry steel strings. The top and back are slightly arched; "Built under Tension" was the brothers' descriptive phrase. The X bracing is made of spruce with the brothers' patented strip of ebony laminated in the center, which strengthens the top without adding weight. The 1904 patent number stamped into the back strip was awarded for this innovation, unique then and now. Despite probably attaining its centennial, this guitar feels entirely comfortable to the modern player and makes a fair case for the Larsons being the most advanced luthiers of their day and true pioneers of the American steel-string flat-top guitar. While the overall workmanship on this and other Larson guitars is not as neat in detail as what is seen on period Martin instruments, the design elements and creativity involved are certainly on a similarly high level. Playing a Larson instrument, especially one with their signature laminated bracing, is a unique and rewarding experience; the tone is distinctive and has a "singing" quality unlike any other flat-top guitar. This guitar has had an eventful life but remains a fine example of the brothers' work and a lovely guitar to play. Overall length is 38 1/2 in. (97.8 cm. ), 14 3/16 in. (36 cm.) wide at lower bout, and 3 5/16 in. (8.4 cm.) in depth at side, taken at the end block. Scale length is 25 in. (635 mm.). Width of nut is 1 7/8 in. (48 mm.). This guitar has a decent amount of play wear and some old repairs, but is a very fine playing and sounding instrument with a lot of character. The finish -- especially on the top -- shows numerous spots of wear and there is some old light overspray in some places. There are two sealed top cracks, by the treble side of the fingerboard and just off the waist, and several grain/seam repairs to the back but nothing serious. The guitar has had a neck reset, some fret work, and a slightly oversize repro bridge and larger maple bridgeplate added, so it is now a superb player. A nicely worn-in and great-sounding old Larson; a delight to play and hear. Very Good + Condition.